This Hinkley Wexley 3 light ceiling pendant in heritage brass finish with crystal accents and clear glass features transitional vintage style and artisan elegance. Featuring a circular ceiling mount, chain suspension and detailed curvaceous baluster body, inset with a crystal sphere. A clear glass oval shade containing three mini candelabra style lights is finished with a lower finial. 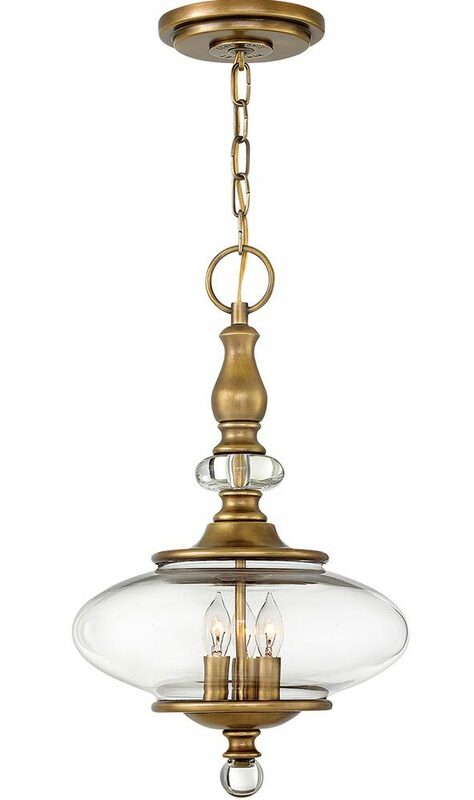 The Wexley is a distinctive transitional pendant with bold, oval shaped clear glass as the centerpiece of the design. Decorative cast details and crystal accents, combined with the rich finish make a stunning statement pendant with vintage flair that’s suitable for a variety of interior styles. Perfect for a bedroom, dining room, hallway or living room with sufficient ceiling height. Supplied with 152cm of suspension that can be shortened at the time of installation to achieve the desired drop; please see below for dimensions. There is a coordinated five-light fitting available in the Wexley collection, please scroll down this page to view. This statement-piece ceiling light is supplied by Elstead Lighting and designed in the USA by Hinkley, founded in 1922 in Cleveland, Ohio. They have transformed from a small outdoor lantern company to a global brand intent on bringing you the best in style, quality and value designs like the Wexley 3 light ceiling pendant in heritage brass finish with crystal accents and clear glass featured here.